Dremel 150 Drill Bit 1/8"
New Dremel #150 Drill Bit 1/8" Ideal for drilling into soft materials. New Dremel #401 Mandrel for polishing wheels A shank with a threaded head. It is used primarily with polishing bits and accessories. New genuine Dremel #402 Mandrel only for sanding discs & cutoff wheels Simply remove the screw, line up a cut-off wheel or sanding band over the hole in the shank, and replace and tighten the screw. New Dremel #415 Dressing Stone A solid block of extremely hard abrasive measures approx. 1"x3/8". Ideal for cleaning and reshaping grinding stones for specific applications. - For best results, insert the accessory bit all the way into the tool and then back it out slightly before tightening down. This provides plenty of shank for the collet or chuck to hold onto.- Abrasive accessories will wear out and change shape during use. Its a good idea to balance abrasive points and grinding stones before each use.- To rebalance a worn accessory, place the dressing stone in a vise to hold it in place. After making sure the accessory is mounted securely in the tool, turn on the tool and file the point or grinding stone against the dressing stone to the desired shape. New genuine Dremel chuck number 4486. The Dremel Chuck allows you to quickly and easily change accessory bits on Dremel rotary tools without changing collets. It will accept all accessory bits with 1/32" to 1/8" shanks. Use with rotary tool models 275, 285, 395, 398, 750, 770, and 780. Also use with Dremel attachments 212, 225, 575, and 961. 90827 Carbon Motor Brush for these tool models only One pair of motor brushes for use with Dremel rotary tool model(s): 270, 280, 370, 380. New Dremel 90929 Carbon Motor Brush One pair of motor brushes for use with Dremel rotary tool model(s): 275*, 285*, 395* (Type 1,2) only. New Genuine Dremel motor brushes for use with Model 275, 285, 395 and 595* rotary tools (Type 3*, 4*, 5* and 6 only). They can also be used with the Dremel® Contour Sander (Type 1 and 2). 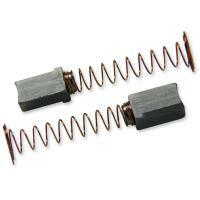 item 90930 Motor brushes consist of a coiled spring of metal with a piece of carbon at the end. They go under the brush cap and rest on the armature, providing the electrical connection to keep the tool running. 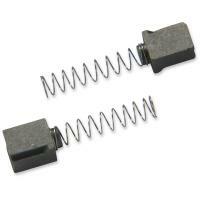 These easily replaceable accessories also help extend the life of the tool. You should check both motor brushes after every 50-60 hours of use. Simply unplug the tool, open the brush caps and remove the carbon piece from the holder. If there is less than 1/8" of carbon left on either brush, they both should be replaced.